Nine frames or ten in the brood box? Posted on May 1, 2012 | Comments Off on Nine frames or ten in the brood box? I am often asked whether to use nine or ten frames in brood boxes. The answer is up to you, but here are my thoughts. Conventional beekeeping boxes are designed for ten frames, which allows for the bee space (about 1/4”) between the combs when they are drawn out. Bee space is the largest gap that bees will leave as open space without trying to fill it with unwanted comb. I have often seen hives where the bee space has been violated, and the bees built an extra comb, often attaching two adjacent frames. It is messing with Mother Nature when we push the envelope on bee space, but beekeepers love to be innovative (or sloppy – I’m a sloppy old stick in the mud myself), so we push this limit all the time. Fortunately, there is some wiggle room in the bee space concept. If we only remove one frame in the brood box and go to nine, keeping the remaining frames evenly spaced, the violation of the bee space is so slight that we can get by with it most of the time. Some beekeepers prefer to use nine frames because it leaves more room between the combs, making it easier to remove and replace frames. However, it is important to ALWAYS keep these nine frames evenly spaced and ALWAYS, when starting brood boxes with frames containing new foundation, start with ten frames. If you wish to use nine ultimately, remove one when the comb on nine or ten of them has been drawn out. If you start with nine, the bees will often build that layer of extraneous comb right away. To keep the frames evenly spaced, I suggest using a tool which is pushed down into the hive box to separate the frames, and which goes by the practical if unimaginative name “frame spacer tool”. I do not like the frame spacers that are nailed into the brood boxes. There are two reasons for my issues with this type of spacer. First, you need to start with ten frames and you cannot do that if you have spacers that only allow nine in a box. The second reason is that, when working bees, I like to start by completely removing an end frame from the brood box I’m working in, then pull frames over as I remove and inspect them. This creates an extra space to manoeuver in and helps me keep track of my progress. With the nail in spacers, I can’t pull frames over – a problem I run into when helping other beekeepers who use them. That said, and although I think it is fine to use nine frames in the brood boxes, I use ten. For a while, I tried nine frames, but eventually went back. Why? For one thing, I realized that I was giving up a frame of brood in each box. I was losing 10% of my brood capacity in each hive – more than that, because, most of the time, the bees don’t rear brood on all of the frames in a box. Usually, eight at most have brood, because some frames are filled with honey. So I was giving up one brood frame out of eight, or at least 12.5% of the brood capacity of the hive. I’m trying to produce honey, and more bees equal more honey. A pretty simple equation. The other reason I stopped using nine frames is that, no matter how careful I was about spacing the frames, I ended up with some thicker combs. That caused problems when I was making nucs in five frame nuc boxes. I often could not get five frames of thick comb into the nuc boxes and, when I could only fit four in, the combs on those became even thicker. So I went back to ten. Many newer beekeepers worry about harming bees, especially the queen, when trying to remove ten frames and then squeeze them back into the brood box. If it makes you feel better, try using nine instead. Just be aware of the considerations I’ve mentioned. It is not quite as simple as just putting nine frames in the box. The foregoing discussion has been about brood boxes. Honey supers are different, and I have a different opinion about the optimum number of frames in honey supers. I’ll explain why in another post. I’ll also have some photos of removing frames from brood boxes (with ten) and write a post on that as well. 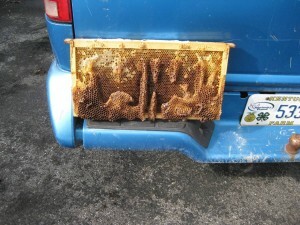 This entry was posted in A Tale of Two Hives, Beginning Beekeeping, Hive management. Bookmark the permalink.